For more than 175 years Knorr has been delivering great tasting, high quality products to chefs and home cooks throughout the world. Knorr is passionate about taste because they are chefs themselves. The team of chefs help devise Knorr's culinary creations, with good food, convenience and innovation at the top of the agenda. 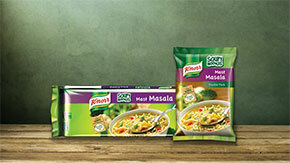 Through mealtimes, the Knorr brand reaches over 320 million people every day. More than any other single foods brand in the world. This passion for good food lies at the heart of Knorr - and it's the reason why Knorr is Unilever's number one food brand, sold in 80 countries around the world. The Knorr brand offers a wide range of soups, gravies and sauces designed to taste delicious and make mealtimes a nutritious, easy and enjoyable experience for everyone. Whether you're serving Indian or Chinese for dinner, our Easy to Cook product range has a spectacular selection of gravies that will allow you to make restaurant like food at home. Cook your favourite restaurant-style Chinese dishes like Vegetable Manchurian and Chicken Chilli at home. A sauce made from soya, green chilies and garlic whose gutsy spice packs a real punch. With such well-loved flavours, this sauce mix can be used to make any one of your favourite Chinese Chilli recipes. Generous amounts of ginger, garlic and soy sauce make this Indian Chinese invention an all-time favourite. Large quantities of dried red chilies and garlic are used to make this intense sauce, fiery in both taste and colour. Spice up paneer, chicken or fish at home with Knorr's Chinese Schezuan sauce. Whip up your favourite Indian dishes like Hyderabadi Biryani and Paneer Butter Masala with Easy to Cook meal makers. A delicacy of Punjab, this rich, creamy Dal Makhani mix will make cooking this Punjabi favourite easy as� well, dal makhani! Your made-at-home dal makhani will taste as good as any five star hotels. This convenient mix has all the flavour of the ingredients that go into an authentic Hyderabadi Biryani. Now make a delicious Chicken or Vegetable Hyderabadi biryani at home with this easy to use mix. Use this mix to add flavour to any of your meat dishes or vegetable curries. A rich tomato gravy loaded with butter and infused with aromatic spices is now easy than ever to make at home. Use this sauce mix to make restaurant quality dishes like Paneer Butter Masala, Vegetable or Chicken Makhanwala. The perfect blend of north Indian spices used in a traditional Punjabi style chole. Use this mix to make any of your favourite chole recipes. This tasty blend of Indian masalas, make the perfect Punjabi chicken curry every time. This mix is so versatile it can be added to a variety of home cooked dishes like kheema mattar, mushroom curry, or even a Kerala roast chicken. Add this mix to any of your homemade chicken dishes like Kadhai Chicken or Malabar Chicken. Warm and hearty, our wide ranges of soups are the perfect accompaniment to your main course. The classic tomato soup has gone desi with a dash of Indian spices. Thick and hearty, Knorr's Classic Thick Tomato Soup pairs perfectly with a grilled cheese sandwich or freshly fried croutons. For a creamy texture, add � cup of milk to your tomato soup. Use to make a variety of dishes like Baked Cannelloni, Tomato Rassam and Mediterranean Chicken. A m�lange of hearty vegetables and flavourful cheese make this delicious soup a perfect companion on a monsoon evening or a winter night. Team it up with your favourite pasta cooked in one of Knorr's Italian savoury sauces. Use this soup mix to make a healthy Cauliflower Au Gratin or a Curried Vegetable Stew. Spicy and pungent, this traditional Chinese soup is flavoured with large amounts of red and green chillies, soya sauce and vinegar. A pinch of sugar cuts the acidity just enough to make this soup scrumptious and satisfying. To make this soup more flavourful, add shredded chicken, vegetables like mushrooms and bamboo shoot. Spicy and pungent, this traditional Chinese soup is flavoured with large amounts of red and green chillies, soya sauce and vinegar. A pinch of sugar cuts the acidity just enough to make this soup scrumptious and satisfying. To make this soup more flavourful, add vegetables like mushrooms and bamboo shoot. Creamed sweet corn and fresh vegetables like carrots, celery and spring onions, make soup both sweet and savoury. Its subtle flavours are sometimes jazzed up with a hint of spice; this soup has been a long time favourite in the Indian Chinese food arena. This tangy tomato soup is filled with the goodness of fresh vegetables and fun noodles. Lavish amounts of soya sauce, garlic, chillies and corriander make this clear soup decidedly delectable. Made in restaurants and road side food carts this soup is now easier than ever to make at home. Sometimes the tastiest foods are the simplest to make! This effortless mushroom soup packs in all the flavour of real, fresh mushrooms. Add chicken or vegetable stock, freshly sliced mushrooms and your favourite dried herb like oregano or rosemary. Our unique spicy and slurpy, soupy noodles are available in your all time favourite masala flavour, with the goodness of vegetables. This magical mix contains the all time favourite masala noodles with the goodness of vegetables in a hearty soup. Spicy and slurpy, this noodle soup is a meal in itself! Children love this easy to make soupy noodle.